Britain's Tyson Fury is free to resume his boxing career after accepting a backdated two-year doping ban. The former world heavyweight champion tested positive for a banned steroid in February 2015, but blamed the result on eating uncastrated wild boar. His victory over Wladimir Klitschko in 2015 was his last fight before beginning his legal battle with UK Anti-Doping (Ukad). Fury, 29, said he was glad he could put the "nightmare" behind him. He will be free to return to the ring once he regains his boxing licence from the British Boxing Board of Control (BBBofC), who Ukad say have accepted the outcome. Hughie Fury, Tyson's cousin, has reached a similar agreement after he also tested positive in February 2015. Both men were not charged until June 2016 and both continue to insist they have "never knowingly or deliberately committed a violation". Last month, BBC Sport reported Ukad feared it could be made insolvent or require a bailout over the dispute had Fury been cleared. However, Ukad chief executive Nicole Sapstead insisted there was "absolutely no whitewash and nothing to be fearful or embarrassed about" in the decision. She said the anti-doping agency had been "completely transparent" and that the developments represented a "good outcome", given their conviction that a doping violation did take place. A Ukad statement read: "In recognition of the retrospective counter-arguments and the risks inherent in the dispute resolution process, each side has accepted a compromise of its position." In a statement Tyson Fury said he and Hughie were "happy" the issue had been settled and that they can "move forward knowing they will not be labelled drug cheats". Both fighters' respective bouts in February 2015, including Tyson's victory over Christian Hammer, have been disqualified but results after that date, including the win over Klitschko, stand. "I'm a fighting man through and through and I've never backed down from anyone in my life and I was certainly not going to back down from fighting this dispute," he said. Following the decision, Fury called out fellow Briton Anthony Joshua - the IBF and WBA heavyweight world champion - on social media, saying "where you at boy? I'm coming for you punk". Joshua defended his world titles in October, while the other two world belts are held by American Deontay Wilder and New Zealand's Joseph Parker. Last month, Joshua's promoter Eddie Hearn said there was "absolutely no question" Joshua would face Wilder in a unification bout in 2018. "Next year I will be back doing what I do best, better than ever and ready to reclaim the world titles which are rightfully mine," Fury said. "It's time to get the party started." There was no sign of Tyson Fury on Monday morning at the central London venue where his hearing with Ukad was due to take place. Now we know why. His lawyers were in deep discussion with the anti-doping authority, cutting a deal acceptable to all sides to this dispute. Ukad insist that a threat of a loss of earnings lawsuit, if Fury won, played no part in their decision. Nevertheless, the conclusion of this long-running saga will be hailed as a victory by all parties with Ukad getting an admission of guilt and Fury given clearance to resume his career. As for the wild boar? He is sadly unavailable for comment. 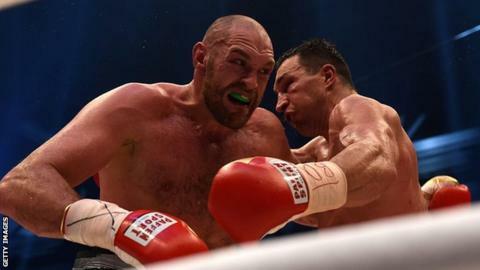 Fury secured the WBA, IBF and WBO heavyweight belts by defeating Klitschko in Dusseldorf in November 2015, although he was forced to relinquish the IBF title soon afterwards after refusing to fight the organisation's mandatory challenger. A rematch with Klitschko was scheduled for summer 2016 but Fury was forced to postpone because of injury, before later withdrawing. Ukad confirmed in June 2016 that he and cousin Hughie had tested positive for a banned substance - now confirmed to be banned anabolic steroid nandrolone. Nandrolone acts similarly to the hormone testosterone and the Furys have relied on a defence that they ate uncastrated wild boar - which is naturally high in testosterone - as the reason for failing the tests. The pair were charged by Ukad but provisional suspensions were lifted in August 2016 after appeals. Two months later, Fury gave up his world titles to focus on mental health problems and the BBBofC suspended his licence "pending further investigation into anti-doping and medical issues".